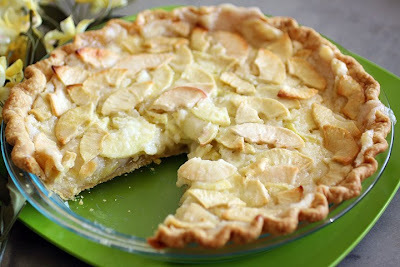 I’m excited about this pie and really want to share it with you! I had a single dough from a double crust pie dough box that needed to be used, a ton of apples, part of a container of sour cream, and a little half and half. This pie is what I came up with. Seriously, this is good pie. It’s sweet from the apples and sugar, with a bit of tang from the sour cream, and custardy from the half and half. I hope you’ll try this one. Or you can just nod your head and back away slowly from the crazy leftover lady. Maybe I should call this leftover pie. No, that wouldn’t be good. Then you’ll never want to make it. ½ cup regular or light sour cream (Non-fat won’t bake correctly). 1. Place the oven rack in the lower third and preheat to 350 degrees. 2. Lay the pastry in a 9” inch Pyrex dish, (not the 9 ½” deep dish). Brush the bottom and sides of the dough with a little egg white. Flute the edges of the pie dough. 3. Place the sliced apples in a large bowl. Sprinkle lightly with fruit fresh. 4. Place the flour and sugar in a small bowl and toss to combine. Don’t skip this step or you might have flour clumps in your finished pie. Toss the sugar mixture in with the apples. 5. In another small bowl stir together the half &half and sour cream. Toss the mixture in with the apple mixture. 6. Pour the apple mixture into the pie dish about 1/3 at a time arranging the apples nicely as you go. Move the apples around a bit to even out the liquid. Dot the top of the pie with the butter. 7. 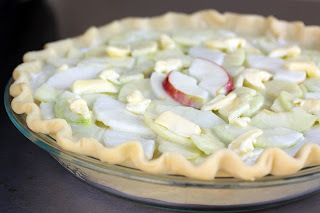 Place the pie in the oven and bake for 1 hour, or until the top apples are lightly browned on the edges. 8. Move to a cooling rack and cool until barely warm to the touch or completely cool. Can be served warm or cold. I used to make my own, but never do anymore. Buying them is too easy! I will try this. ANd I love coming up with new recipes from leftovers all the time. This really works- it looks amazing. Ill have mine warmed up with some vanilla ice cream on top..
Looks delicious. Not sure I will make it with the sprinkle of the stay fresh since I will bake it immediately and eat it even quicker! Gorgeous! And I love recipes to use up leftovers. I'm impressed that you just came up with this recipe on the fly - it sounds divine! I can't wait to give it a try! PS - a little water w/lemon juice will work in place of the fruit fresh to keep the apples from darkening. Drain and dry before using. LOL - thanks for the comment about the mascarpone. Doesn't everything taste a little bit better with a touch of Italy? That is one good pie that you came up with! Thanks for the heads up on the non fat sour cream. Of course, the photos are AWESOME!! Can I send you my salmon salad sandwich for you to photograph? Looks good like always!Pictures are awesome! The pie looks fantastic Nicely done. A delicious treat! Thank-you Marla! For being brave enough for trying this crazy pie and for letting me know! I am so happy.